Under existing law, President Trump can have the Army Corp of Engineers build the wall, and use seized Mexican drug money to pay for it. He does not need the permission of Congress. This would fulfill his campaign promise to have Mexico pay for the wall. So, yes, President Trump can and will declare an emergency and build the wall. Despite the Democrats in Congress chagrin, Congress can do little to stop him and hence the Democrats would be foolish to try to stop him either by legislation or a court challenge. Under the law it’s hard to imagine what criteria a federal court could use in trying to decide whether a national emergency was properly declared, or not. Donald Trump knows this quite well. This is why he has gone about business and setting the dates he has to support his strategy — allowing the situation to play out as it has to date. As the President stated, he has preferred to work it out legislatively through negotiations with Congress, but he knows all too well it would be fruitless and unproductive and most important not serve the American people well. As the President has said; “I’ll declare an emergency if no deal on wall.” Stating such on January 25th; President Donald Trump says he will declare a national emergency to build his U.S.-Mexico border wall if there is no deal with Congress by mid-February. 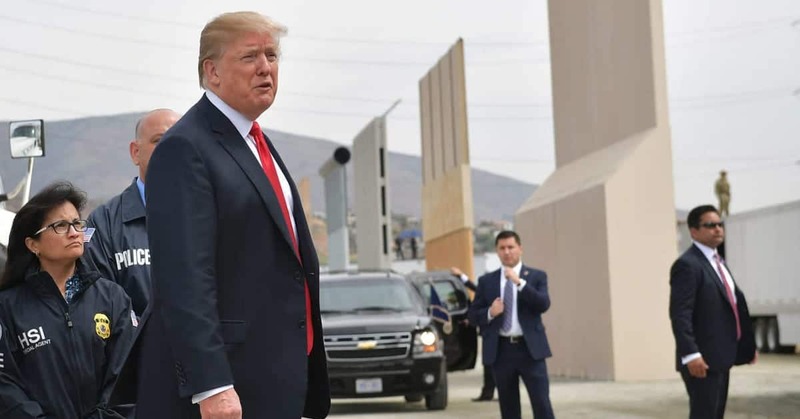 As noted with a certitude and confidence unseen in presidents since Ronald Reagan, President Trump warned if Democrats don’t provide money for a border wall, he’ll likely get it by declaring a federal state of emergency. Despite the rhetoric, understand Congress has not actual placed any barriers on presidential prerogatives to declare such states. The Democrats in Congress, both Schumer and Pelosi know that. Furthermore, they also know that any such declaration by the President will activate over 100 extraordinary powers afforded to President Trump, which will be nearly impossible to countermand. The Democrats have also been careful, along with the mainstream media, not to mention at all the fact that other presidents have used similar authority. In 1979, President Jimmy Carter declared that a state of emergency existed with Iran and blocked Iranian assets. That state remains in effect, along with 31 others issued by presidents since. Presidential declarations of states of emergency have transpired since Abe Lincoln’s administration. Under the 1976 National Emergencies Act, Congress can override such actions with a two-thirds vote in the U.S. House and Senate. However, in this case, that’s not in the cards. Trump knows that too. The fact that some, particularly on the political-left claim that the legal arguments favoring President Trump pulling this off are specious, and even absurd. But legal arguments can’t be considered frivolous if a majority of U.S. Supreme Court justices support them. In terms of actually getting something done, the President holds some good cards. Also, should it actually be taken before the U.S. Supreme Court, when the Justices actually rule, they may be minus one leftie; Justice Ruth Bader Ginsberg, who’s health has been precarious. 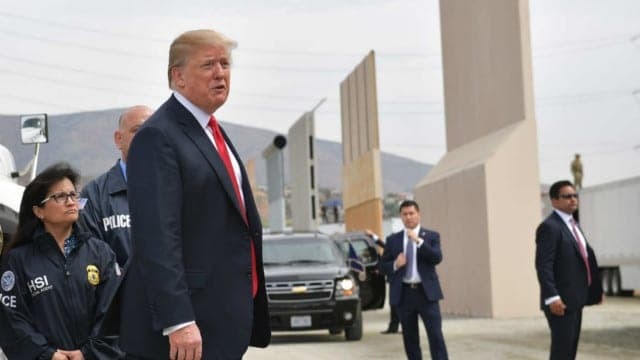 Promoting the wall helps President Trump politically; if it’s built, and or is under construction in 2020, he’ll be re-elected. But by opposing it, President Trump’s foes are playing into his hands and taking his bait. Politically, blocking this wall and/or trying to defund it will enrage Trump’s base and increase voter turnout for him where it matters. And while the issue will also drive-up Democratic turnout, it would nearly be enough to win. In fact, Mathematically, Trump could even lose by 5 million to 6 million popular votes while carrying 40 states. But on the issue of the wall, he will hold all of the states he won in 2016 and net six or eight more, due largely to this issue…thus winning by a great margin in the Electoral College. Legally, all in all, in the 43-years of National Emergency Act’s existence as law, no Congress has ever voted to terminate a declared state of emergency, and no court has countermanded any such presidential decree. Should Trump declare an emergency to build the wall, he’ll likely tap funds already appropriated by Congress for other military construction projects. Statutorily, presidents can redirect already-appropriated funds, and lacking clear statutory definition of what constitutes an emergency, any legal challenges to such a declaration will likely fail. Finally, there are the several other authorities, that deal strictly with national security that allow for the President to not even declare a national emergency, and again, the Democrats know this as well. In addition, President Trump also has authority to use seized drug assets to pay for the wall. Federal law authorizes the Attorney General and the Secretary of the Treasury to share federally forfeited property with participating state and local law enforcement agencies. The exercise of this authority is discretionary and limited by statute. The Attorney General and the Secretary of the Treasury are not required to share property equally, as they are free to dole it out to any agency of government that participates under; 21 U.S.C. § 881(e)(1)(A), 18 U.S.C. § 981(e)(2), and 19 U.S.C. § 1616a; 31 U.S.C. § 9705(b)(4)(A) and (b)(4)(B). As a result, there is more than enough seized money available. Last year alone, $1.6 billion in cash was seized, and that does not include tens of millions more in property seized. That annual cash flow will easily pay for the wall and roads. According to audit by the Office of Inspector General there is $6.6 billion in the seized asset fund as of 2018. What’s worse for the Democrats is their continued effort to bash Trump in the way they are. Liberals are making the same mistake with Trump as they did with Reagan; to them, he’s merely an ignorant, trigger-happy, insipid, out-of-touch media creature. But astute moderate to perhaps small “c” conservative Democrats will favor the wall even if only for safety and national security reasons. Conclusion: President Trump already has the authority to use the military to build a border wall and roads. All he has to do is notify Congress, and has already been warning Congress he will do so. This Tuesday’s State of the Union address will likely be the final effort to set the table, to be followed by the official declaration on or after February 15th. Realize again, the President already has the authority to make Mexico pay for this wall by using seized assets. Some may wonder whether or not President Trump is aware that he already has the authority to do this without declaring a National Emergency. Trust me he knows it and as I said, has used this authority to justify his current stance on the issue… it’s more than obvious.